The December 2014 issue of The Soda Lime Times(link), an "In-Box Magazine about and for Lampwork Bead Makers", was published yesterday. It features interesting articles, tutorials, and photos of beautiful glass work by lampwork artists. with this picture of one of my blown conch shells! "Folks can can come to www.sodalimetimes.com for a free issue and to subscribe - or just to learn more about the magazine." The monthly issues are available on an individual basis for immediate download, so you're not committed to receiving for a period of time, unless you desire. 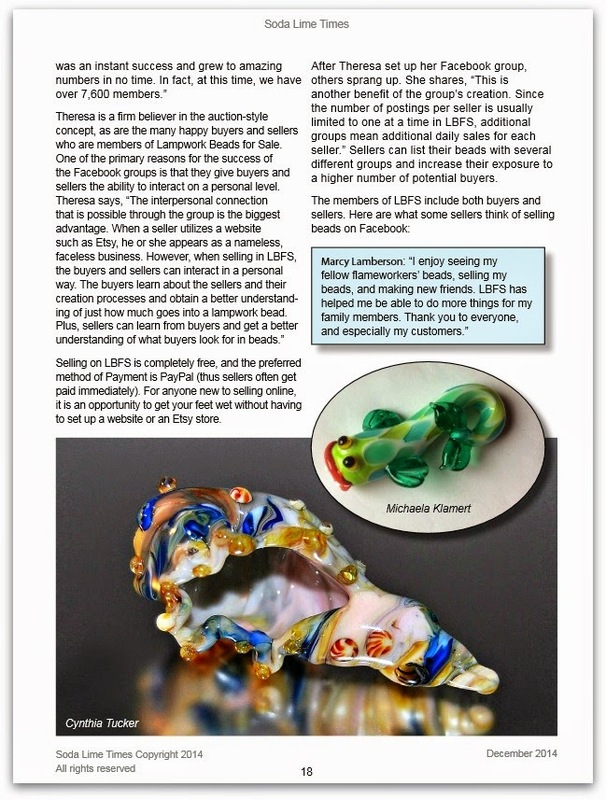 My thanks to Diane and her staff for a quality publication and support of the lampwork community. I look forward to it every month! Congrats on having one of your stellar conch shells featured in this article! You rock!